Sergeant will be performing at the party. Glenrothes will celebrate its 70th birthday on Saturday, with a huge party at Warout Stadium. The stadium will be split in two, with a family fun area at one side, and a live music area at the other. Glenrothes band Sergeant will be reforming after a number of years for a one-off performance to help the town celebrate the occasion. A number of Scotland’s best tribute bands will also be performing, including Dirty Harry and Bwani Junction. A beer tent will help keep the music fans well hydrated, and there will be range of street food stalls to make sure no one goes hungry. 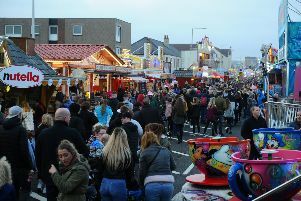 Children will be able to enjoy free fairground fun between 11am-5pm, with rides, an inflatable village, and plenty of food and drink. Between 11am-noon will be dedicated to children with disabilities or who require extra support. Directly opposite the stadium another event will be running simultaneously which will include many local organisations along with the army, fire brigade, falconry, Peachy Keen with their eco friendly energy machines, the 89th Scouts and much more. Councillor Altany Craik reiterated the fantastic support shown by local businesses and organisations, including Kingdom Shopping Centre, Semefab, BoschRexroth, Easy Living Developments, Altmore, Babcock and Fife Council, amongst others. “Without these fantastic and generous local businesses we would have been unable to host this day, especially the more than 2500 free wristbands allocated for children to enjoy,” Mike Mowat from Go Glenrothes added. “We hope people have a wonderful day and also enjoy all the many other #GR70 events planned for the rest of the year. For more details and information about the event, and to purchase tickets, visit the website http://glenrothes70.co.uk.